Nationally, quarter-over-quarter home price growth has slowed slightly from 0.9% to 0.8%; however, this aggregate measure disguises a growing regional divide. The West region continues to pace the nation with 1.2% QoQ growth, thanks to high levels of growth in the Pacific Northwest, the Sacramento Valley, and Arizona. 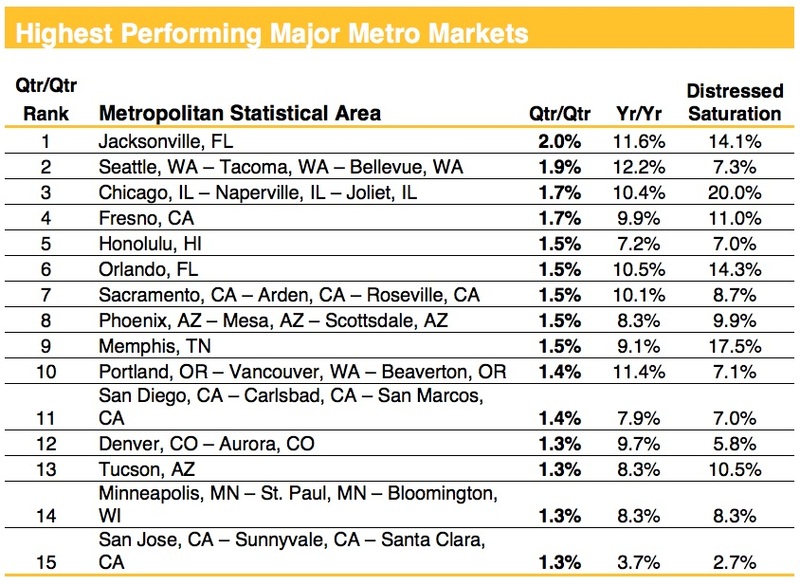 Of the top 15 metros, 9 are in the West region. San Jose has begun to see growth accelerate, entering the top 15 with 1.3% QoQ growth, despite a meager 3.7% growth rate since this time last year. The Northeast, despite not having any metros in the top 15 and being the only region to experience a significant increase in distressed saturation (up to 14.3% from 13.9% last month), is not far behind with 1% QoQ growth, an uptick from 0.9% since last month. Despite the summer selling season beginning to heat up, growth in the South has begun to slow down, with QoQ gains of 0.6% (down from 0.8% last month). Memphis, which was the worst performing market in terms of QoQ growth last month, is showing signs of life, jumping into the top 15 with 1.5% QoQ growth (up from -0.3% last month) and 9.1% YoY growth (up from 6.7% a month ago). 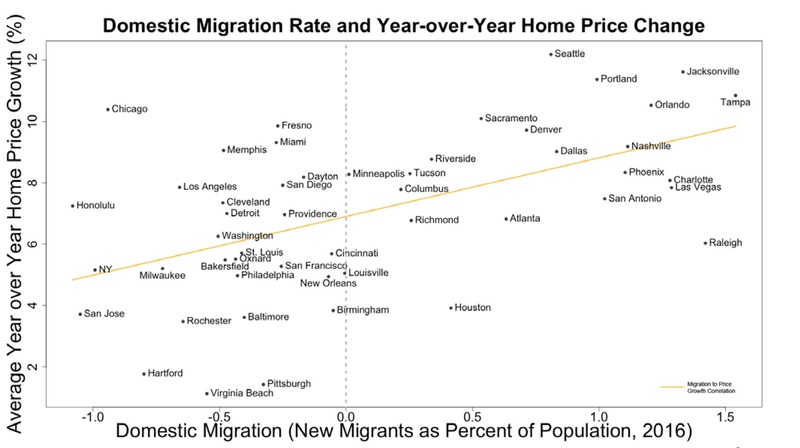 Despite this impressive turnaround and the contributions of the Florida markets, the South region's growth has been stalled by Virginia Beach, Baltimore, Houston, New Orleans, Louisville, and Birmingham, all of which have grown by less than 0.6% QoQ. The Midwest remains the slowest growing region in the nation, with QoQ growth slowing from 0.6% to 0.5% last month. Nonetheless, Chicago has begun to heat up, jumping into the top 3 in terms of QoQ growth at 1.7% (up from 1.5%). 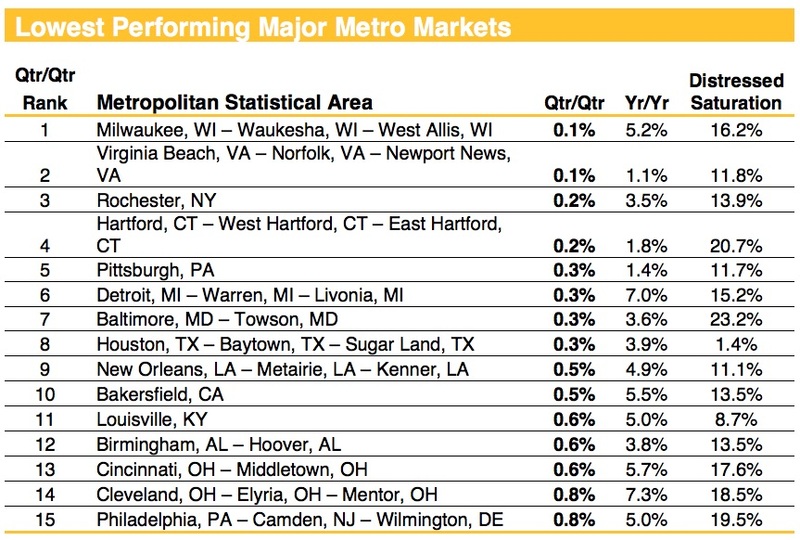 Chicago, despite having a declining population in 2016 and 20% distressed saturation, is one of only 7 metros to achieve double-digit YoY growth. While Minneapolis has maintained its 1.3% QoQ growth from last month, Cleveland and Cincinnati have seen significant headwinds. Both of these metros had been experiencing strong QoQ growth last month at 1.2%, but have slowed considerably to 0.8% and 0.6%, respectively. In particular, Cincinnati is showing warning signs with distressed saturation increasing dramatically from 14.5% to 17.6% in the last month. Clear Capital's patent pending technology generates the timeliest indices in rolling quarter intervals that compare the most recent four months to the previous three months. The rolling quarters have no fixed start date and can be used to generate indices as data flows in, significantly reducing the multi-month lag time experienced with other indices. Clear Capital is a nationwide provider of real estate valuations, data and analytics, quality assurance services and technology solutions. The Company's customers include mortgage lenders, servicers, investors, GSEs, and Ratings Agencies. Clear Capital products include appraisals, broker price opinions, property condition inspections, value reconciliations, appraisal review and risk scoring, automated valuation models, home data indices, and platform solutions. The Company's innovative technology, experienced valuation experts, and a well-trained network of more than 30,000 field experts sets a new standard for accurate, up-to-date, and well documented valuation data and assessments. Morningstar Credit Rating issued Clear Capital its highest Residential Vendor Ranking - MOR RV1. Clear Capital's home price data can be accessed on the Bloomberg Professional service by typing CLCA <GO>.